Innovate. Design. Develop Engineering Skills. Our region's history of innovation, design, aerospace and manufacturing make the Department of Mechanical and Aerospace Engineering an ideal place for you to develop skills and a career in mechanical, aerospace or renewable and clean energy engineering. We provide a dynamic atmosphere for learning, growing and developing accomplished engineers, scholars and professionals. Our strengths: aerospace, energy, mechanical systems, controls, biomechanics, materials and manufacturing — will become your strengths. We’d love to meet with you. To schedule an academic appointment, email our Engineering Ambassadors at engineeringambassadors@udayton.edu or call at 937-229-5082, and they can schedule an appointment for you with our engineering academic programs and/or with our Diversity in Engineering Center (Minority Engineering Program and Women Engineering Program). Or, click here to complete and submit an online visit request form, and our Ambassadors will contact you. 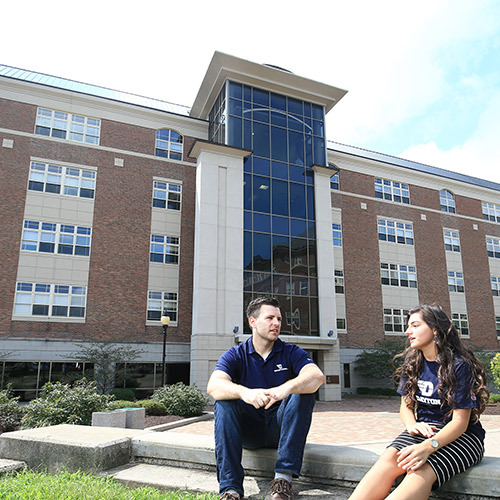 The University of Dayton Office of Admission schedules general University campus visits or tours. Please, click here to go to our Office of Admission website for available options. Our Merlin Flight Simulator Laboratory showcases aerospace student designs through international competitions. 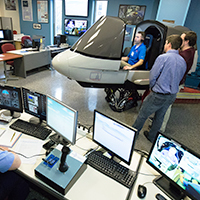 The Society of Experimental Test Pilots (SETP) "fly" the student-designed simulations and contribute to the students' design knowledge. Click here to view video. Click here for mechanical, aerospace, and renewable and clean energy faculty, staff and students In the News. At the University of Dayton, the studies of mechanical, aerospace and renewable and clean energy systems engineering are taught by experts in these areas: aerodynamics, gas turbine combustion, hydrocarbon fuel, biomechanical analysis, kinematic sensors, energy systems, biologically derived nanostructures, environmentally conscious design, non-isothermal deformation processes, polymers and polymeric composites, compliant mechanism design, sound and vibration control, renewable energy systems, electromechanics, biofuels, and carbon sequestration. Our graduates find excellent employment with many receiving job offers before graduation. Would you like to work in design, testing, manufacturing and research in areas such as acoustics, aircraft design, biomedical engineering, construction, environmentally conscious design, environmental engineering, ergonomics, building and industrial energy systems, industrial marketing, manufacturing automation, ocean technology, power generation, renewable energy systems, space technology, structural analysis and design, textiles and food processing, toys, and transportation?